When my mom made plans to come out and visit us she said she wanted to just live our life. You know, be here and just participate in whatever we do in our normal life. Ha! Normal? Not around here, that's for sure. I do not know where these past two weeks have gone, but I know she has gotten to participate. And yesterday a tornado in Omaha that had our kids stuck in a church hall way for 20 minutes. The time has flown and as always we are sad to see her go! Here's hoping we can get her to move here eventually. THANK YOU mom for spending time with us and putting up with our craziness! We love you! YWAM Publishing has long been a favorite in our house for finding good books when it comes to people in history. We own quite a few! But their equally as popular Christian Heroes series is new to us. 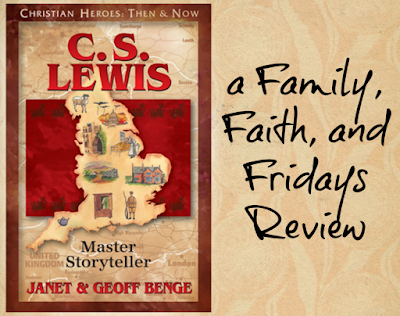 When the opportunity came up to review Christian Heroes- Then and Now, C.S. Lewis, Master Story Teller, by Janet and Geoff Benge, I knew it would be a good fit for us. After all, three of my kids are C.S. Lewis crazy people. In a nice way, of course! We were also given the chance to use the C.S. Lewis Digital Unit Study Guide as part of this review. C. S. Lewis. You know him, right? Literature teacher. Author of over 30 books. Christian writer who believed that the story of Jesus Christ was the "truest of all stories." This 180 page paperback book tells his story. Written for kids ages 10 and up and containing 17 chapters, it is a fairly easy read, but filled with fun facts and exciting stories. How have we used this book? For sheer pleasure reading, of course! My 14 year old son eagerly agreed to be the first to read it. More like ran off with it before anyone else could claim it! Because we added it to his daily Bible time, he was assigned to read one chapter a day. Getting him to agree to that schedule was difficult, and I think in the end he cheated and finished it with several chapters in one sitting. Every day following his reading he would join me in the school area to tell me about what he read. Not because I asked him to, but because he couldn't wait to share what he had learned. C.S. Lewis spent his early childhood in Ireland. He met his wife through letter writing, and eventually married her to keep her from being deported, though they eventually fell in love. Despite what you have heard, he had a precarious friendship with JRR Tolkien. It was fun to see him get so excited about what he read! One of the things that we liked the most is that one of the stories he had heard about C.S. Lewis was also in this book, but with much more detail. THAT I am not giving away so you will have to read it for yourself! He has since passed the book on to his 18 year old sister and she is now reading it, with our 22 year old next in line. As far as the Digital Unit Study goes, because we were using this as an additional Bible assignment, we did the study loosely, much of it orally together. Each chapter has 6 questions for review. The first question is vocabulary related, then a fact question about the text read, 2 comprehension questions, and finally two open ended questions for opinions. The first three questions are geared for younger students, while the next three require a little higher understanding. In hindsight, especially for an older child, I will have them do any other study guides on their own in a notebook, to be graded. Also included in the study guides are applicable Bible verses, essay questions, creative writing assignments, hands on project ideas, and audio/visual projects, as well as art ideas. If you want to explore even deeper, there are community links, social studies notes, and even reproducibles! They are so complete that they could easily be incorporated into unit studies. With 35 additional Christian Heroes books, many with study guide available, I am confident you will be able to find one that fits your school course work, or just tickles your fancy! We have already made a list of the ones we want to read next, with Nate Saint in the lead. Who would you choose? Our Review Crew reviewed many other titles, including some from the Heroes of History series, so make sure you pop over and take a look! Honestly, it is not at all what I thought we would end up in and yet, every day I find something else about it that I just love. But I also moved in knowing that there were some changes I wanted to make. Like the kids' bathroom. It was original to the house, so at 15 years old it was a tad outdated. Since we knew we could make a big difference with just a few minor changes that is where we started this past week. Hubby having a week off was super helpful. And a few final touches! Another thing we have done is transform our front porch with back patio areas soon to come. Both were clean slates, so it was a lot of fun. The only change left is painting the front door. I love the wood, but again, it is 15 years old and quite weather worn. Thinking about black, but if you have any ideas, I would love to hear them! There are little trees in the pots now. Guess I need a picture of that! Still several projects left, but remember what my hubby says, Rome was not built in a day! 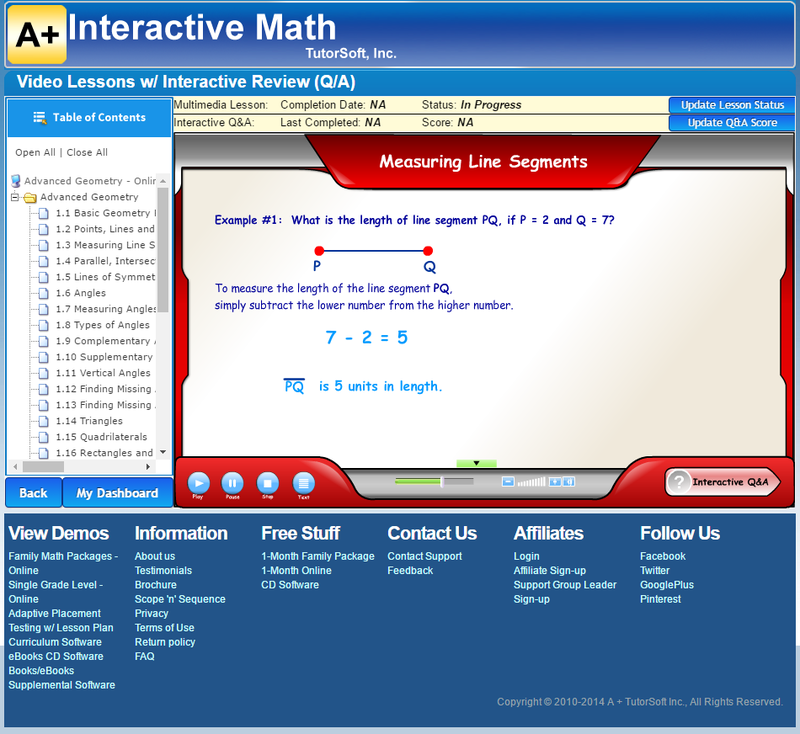 A+ Interactive Math has a new brain child we have been thrilled to review called Math Mini-Courses. Because they span grades 1st though 8th, we have been able to use them with both of my boys! Our 8 year old has been using Elementary and Middle School Multiplication, and our 8th grader has been using Advanced Geometry. Mini-Courses are designed to help a child who is struggling in a specific math area. By using interactive video lessons with automatically graded tests and quizzes, your child can close learning gaps quickly and efficiently. As a parent, you will be given your own login information to access grade reports so you can keep an eye on your child's progress. Though most courses can be completed in 2-3 months, you will receive a year's access, as we did, so you can go back and review at any time during that year. Other features include printable worksheets, text versions of each lesson, and a step by step solution guides for the worksheets. How We Used This Product It is no secret that I love reviewing products, but I especially love when they specifically line up with what we are currently using as the perfect complement. That is exactly the case with A+ Interactive Math's Mini-Courses. Our 3rd grader is currently learning his multiplication facts so the timing of the Elementary & Middle School Multiplication course was ideal. It allowed us to put aside our current program for a few weeks and concentrate solely on multiplication facts. Although you could run the program at the same time as you continue any other math, I liked being able to allow him to concentrate on just the math facts. After logging in to the website and his account, he is able to click on the lesson he is on. The first few lessons of this mini-course fully explain the concepts behind multiplication, so your child knows what the facts mean, just not the rote answer. After that, each lesson concentrates on a specific skill such as multiplying one digit numbers, two digit numbers and so on. There are 13 lessons in all so if you are working for a few minutes every day, the course will not take long to cover. After watching and listening to the lesson, he then is led to a review portion where he answers multiple choice questions. Each question and the answer choices are read out loud, so if you have a struggling reader, do not fear. Once the review is completed, there is a certificate to print out to show your child's progress, which CJ liked a lot! It is funny how something so simple can motivate a child. 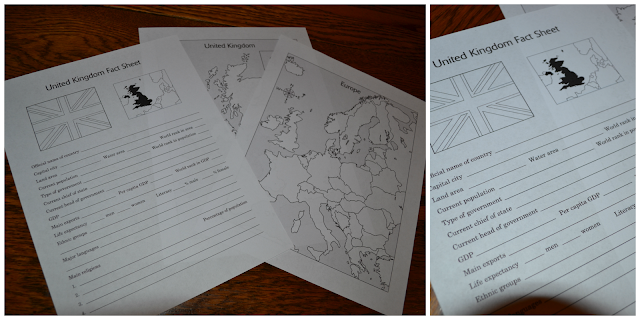 Again, you can also print out worksheets to practice and print out full pdf files of each lesson if you choose. We only used the additional worksheets on lessons that he did not score 100% on during the practice. Our 7th grader's experience was very similar, although we were using the Geometry Mini-Course he had access to as a refresher only, therefore he worked on it only a few days a week. The 31 lessons cover basic terms and concepts and then cover lessons in area, volume, rectangles, lines, rays, and more. Because of that, I think this would also be a GREAT way to review for a child preparing for the SAT or ACT. The 35 lessons are fairly short and, like the elementary program, have a video lecture followed by a short practice. The thing we really appreciated about this level especially is that when a student gets a problem wrong you see the answer fully explained and then have the ability to correct your mistake. While that may not be a big thing in lower level math, in upper level math, sometimes you just NEED to hear and see an explanation of the problem. One thing that my son did struggle with was the fact that you must listen to all of the choices before it will allow you to answer the question. While it bugs him because it "slows" him down, I like it because it DOES slow him down! 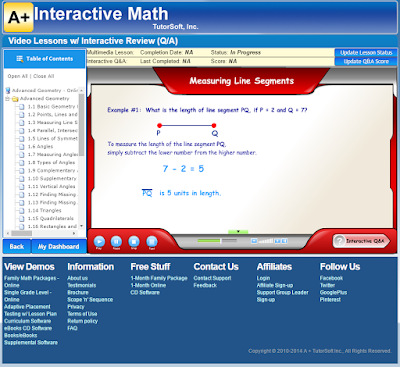 A+ Interactive Math's new Math Mini-Courses are a great review for kids who need a refresher, those who may need some remedial work, or those who are looking to feel out some new concepts! The clear video instruction make it a painless way to practice! I think it started about middle school age. -If I can JUST get to high school, things will be great. Mark your calendar (or mine at least): No more "just a season." Somehow that statement seems to mean that if I can just get through this time, a better one is waiting. And maybe it is. But maybe I am in this season to learn and grow and see what God has for me. OK, no "maybe" about it. That IS why I am in each season. There is no doubt in my mind that God can and will use each season in our lives for His purpose and glory. Every season. 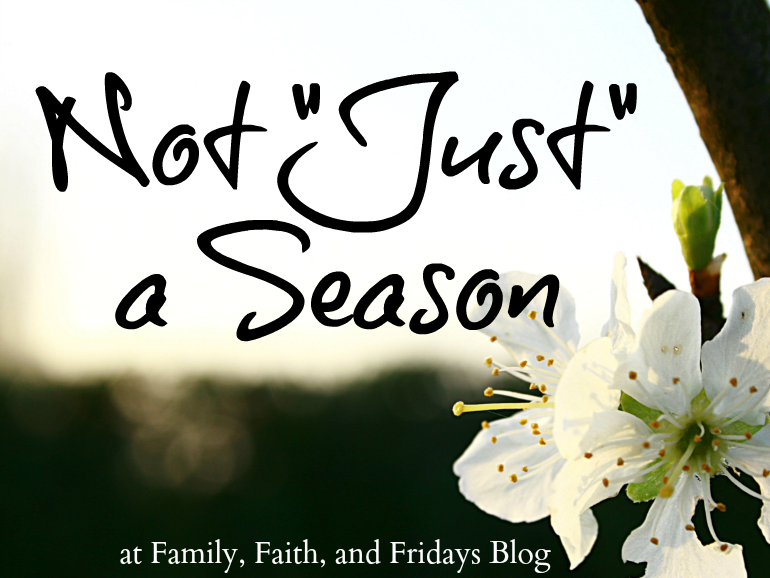 So to label it "just" a season seems to take away the importance of its ultimate purpose. To belittle the lessons. To negate the learning. What if passing though a trial takes us to a mountain top? What if that thorn is producing some beautiful ? What if that heartache and pain makes us stronger? We can't always know what God is doing. Sometimes we may not even see it this side of heaven. But rest assured He is working. And if we shrug it off as just a season we may miss the lessons He has for us. Our road to adoption? A lesson. See a pattern? Each of those "trials" made me who I am today. They are still making me who I am in some ways. Depending on your theology- at the very least, God allowed those things into our lives. At the very most, He planned each one to the minute detail. Either way you look it, God is at the center, He is in control, and He wants what's best for you- all to bring Him glory! So I am giving up that whole "just" a season thing and embracing my life today- where God has me. Because whatever season it is, it is good because it is from God! Linking up with Caroline at The Modest Mom today! 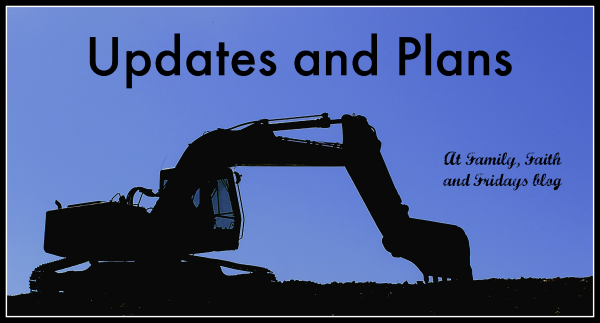 After several review posts in a row last week and this week (yes I still do review things from time to time), I thought maybe I would catch you up on the every day life of the Pleasants. It's not always exciting, but it is always full! 1) For those of you who do not follow us on Facebook, our second daughter had the opportunity to go to a homeschool dance with a good friend of hers. This we have never done before, so it was all new. And fun! They had a great time with all of their friends. 2) My hubby has had the week off so we are knee deep in house projects. Here's a peek, but I hope next week I can do a full post on the work that we have done. 4) This kiddo is also in a big production of Midsummer Night's Dream. Actually they perform twice tonight, with another full cast performing on Thursday and Saturday. This will be her last highschool performance before she heads to college in the fall to obtain her BFA in Musical Theatre. It is my prayer that we learn and grow through ALL THINGS!